Description: The main table is two screens high. There are at least 3 bonus games that are accessible from the top screen. Bonus games consist of knocking out moving targets on a separate single-screen bonus table. The main table also has numerous moving targets and ball locks. Box Text: Imagine a living pinball machine...with aliens and outlandish worlds to throw at you. 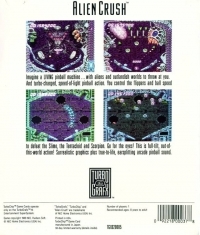 And turbo-charged, speed-of-light pinball action. You control the flippers and ball speed to defeat the Slime, the Tentacloid and Scorpion. Go for the eyes! This is full-tilt, out-of-this-world action! 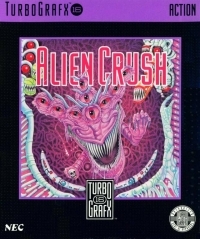 Surrealistic graphics plus true-to-life, earsplitting arcade pinball sound. 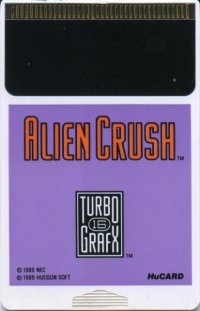 This is a list of VGCollect users who have Alien Crush in their Collection. This is a list of VGCollect users who have Alien Crush in their Sell List. This is a list of VGCollect users who have Alien Crush in their Wish List.